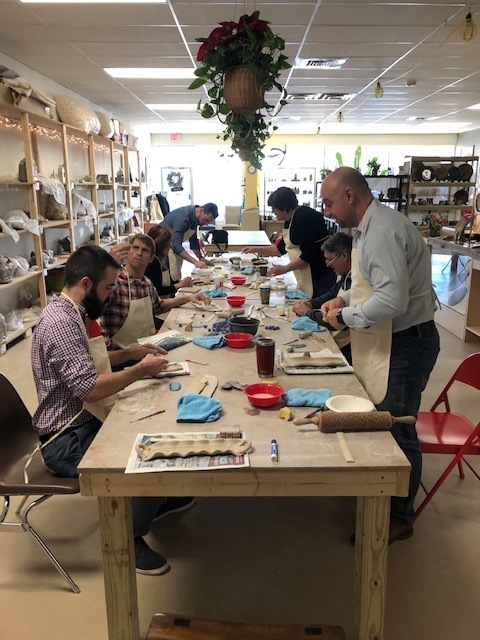 At the Clay and Metal Loft our team building programs combine the elements of fun, interactivity, and creativity to help colleagues work with and appreciate each other's differing expression, talents and contribution, and to accomplish tasks as ONE effective corporate team. No prior pottery, jewelry or artistic skills are necessary for these fun classes. Just come expecting the unexpected as you work with your group in a fun, creative maker-space! Clay MUGS is an innovative, high impact team building class. You and your colleagues will work in teams and be guided to create mugs based on specific themes (e.g. corporate identity or values, personal attributes, favorite bands etc.). You will be amazed by what can be accomplished when everyone comes together through a common (and fun) purpose. Each team member creates their own unique mug and team members help them carve positive attributes, goals, values or intentions into the mug! Join us for a fun afternoon of hands on clay work. Work with The Clay and Metal Loft Instructor to make a functional ceramic project. Team members watch the instructor demonstration, then work with one another to create a one of a kind functional ceramic keepsake. This fun two-hour workshop will be full of laughs and creativity as you get out of your office and work in a fun creative make-space. Each participant creates their own ceramic art piece.